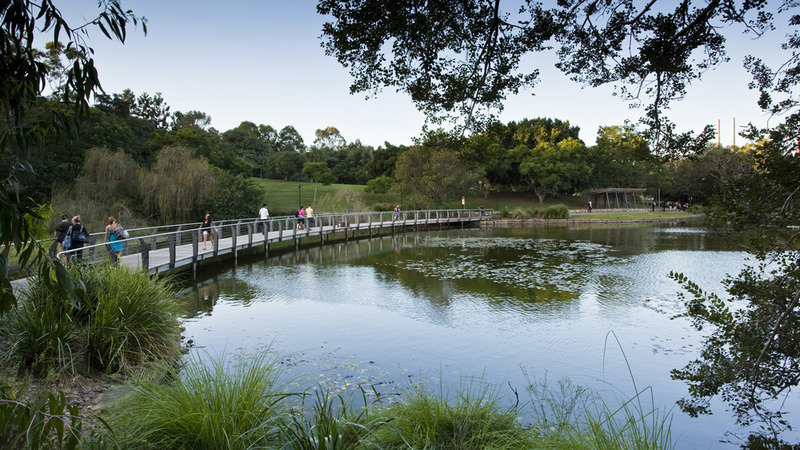 This environmentally sensitive project for the University of Queensland involved the construction of a boardwalk around the lake at the St Lucia campus and to preserve the fauna habitats whilst providing for pedestrian access and recreation. The Lakeside Walk includes an elevated timber boardwalk through a bird breeding area, shelters, seating, drinking, lighting and security facilities. The project took special care to design the facility to standards for access by people with disabilities. A second phase to this Project enabled the construction of an elevated boardwalk traversing over the lake features a sweeping curved form providing a intimate connection to the lake’s ecology with a series of sandstone seating walls and a focal timber and steel portal structure to the eastern edge of the lake. The boardwalk also provides a link to the Conifer Knoll Carpark and connections to General Purpose South, Sir James Foots Building and the Faculty of Engineering, Physical Sciences and Architecture. This project received a Commendation in the Australian Institute of Landscape Architects Award Program 2007.